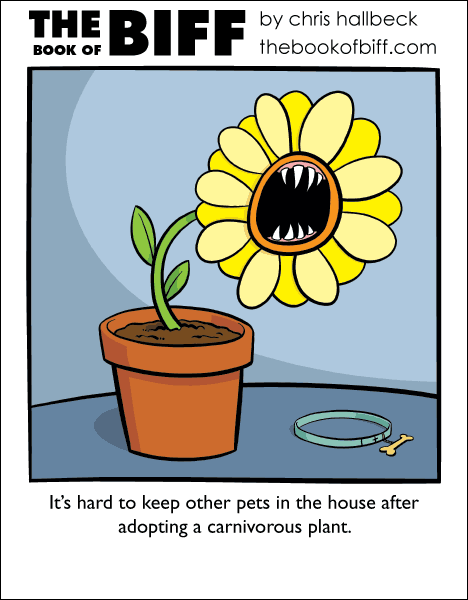 A friend had venus fly traps growing in his garden when I was a kid. It was creepily cool to feed ants to them. It was a rare treat to get to do it though. They are not speed eaters by any stretch. I always wanted a African Strangler like the Addams Family’s Cleopatra. I have venus flytraps… Or, I guess I should say “had”, because they seem to have died. They turned black and looked like they were dead almost half a year ago, and they have looked like that since then. Supposedly they look something like this while in their “resting phase”, but I have no idea if my venus flytraps really are resting or if they’re just dead. Just ‘avin’ a kip after a long squawk? Oookay, so apparently I made a reference to Monty Python without even realizing it myself… Well, if I had made a reference to Monty Python on purpose, it would have been about the phenomenon of Deja Vu.